The practice consists of two teams of five players each (red & white vs. blue) and a neutral player (purple). Two players from each team are positioned in the ends of the field being allowed to move only within the range shown in the picture. They are called “Depth Players” and it is recommended to rotate every player of the team. The aim is to score a goal in any of the small goals. The goal is going to be given only if it comes after a lay-off from a depth-player. There are some nuances to the scoring-system which have important implications in how the game dynamics develop and effects on the actions produced. I will briefly discuss these in the variants section but for purposes of clarity in the explanation the most basic scoring-system (i.e. the aforementioned) is going to be used in the piece. I recommend dividing the zones like they are in figure 1 to help the players position themselves. It can be used explicitly to constrain the spaces allowed and/or needed to be occupied in each moment depending on the position and movement of the ball, teammates, and opponents. Moreover, I think this task should be used as a reminder of the zones to be occupied without the coach explicitly forcing players to occupy them. This can be useful when the players have acquired the foundations of positional references. There are some variants to the zonal division employed that could be useful depending on the scoring-system or several different rules but I want to show this one with the five corridors which is more oriented to the positioning of the players and as such gives more importance to the structure. In short, the most relevant constraints in this task are the spatial configuration intendedly oriented towards the depth, the scoring-system and the positions of the depth-players. This game, as every directional game without highly constraining rules, has the benefit of its versatility and the ability of being adaptable to different goals depending on several factors with small modifications. In a general sense, the goals are around the work of depth-dynamics and actions related with the principle of Verticality. More specifically speaking third man actions and depth combinations. From a theoretical point of view the Verticality principle is one of the most important principles of play. It is about threatening continually the defensive stability of the opponent trying to create dangerous situations. Obviously, there is no option more valuable than a player near to the opponent’s goal and with enough conditions to score or penetrate. In this practice, these players are especially positioned to create third man actions. An important comment to be made here is that this practice should be understood as a component within the process of coaching/teaching a positional based idea and thus within a structured tactical periodisation (which is out of the scope of this piece and does not have anything to do with the popularly known “Tactical Periodisation” ideas). As such, I am assuming implicitly that the players already have the minimum notions about structure and positioning which were explained in depth in my piece last year for this website which can be found here. The above seems not very relevant but functionally it is, since the underlying premise is to find understanding, in this case through third man movements, the intentional positioning, the understanding of how to provoke and exploit positional superiorities through a manipulative actions and purposeful circulation of the ball, among other things. Moreover, closely related to the above I want to briefly outline one of the biggest issues with this sort of game. There exists the risk that the players become excessively oriented towards depth options given the rules and not able to manage the intentionality in the possession or exploring other potential superiorities. We implicitly encourage the use of the depth with the configuration but we should always encourage proper awareness to the players and game understanding to know when to use them and when to manage and find other options, if not we could be in danger of simply teaching contextualised actions but not a proper game understanding. This remains an important feature of the training design and it’s very relevant in a style of play as structured and carefully designed as a proper positional playing idea. Also it is another reason why having coached previously the fundamentals of positioning and structure is a neccesary feature. To end this sort of methodological digression, there is a clear purpose of working the behaviours and actions related with the principle of Verticality but it doesn’t imply another essential feature from the idea of play is going to be neglected because I understand these are foundational to create the conditions where the options to be vertical arise. As such, there is no place to work the third man actions isolated from the principles, to create the structure from where the actions are made. From an individual-centred standpoint the player in possession should be encouraged to look for the furthest option available as they receive the ball in order to gain more space as quickly as possible. The actual design promotes the availability of that option with the two depth-players thus also implicitly guiding the perceptual behaviour towards them. In this case, we also manage to create certain references for the positioning of the rest of the player as we will see later. Furthermore, the body position before receiving the ball and the use of the first touches should be related to the depth options as well since the players are going to getting ready to play with them as they receive the ball. Another relevant coaching point is the type of pass employed to connect with the depth player given the subsequent action to be performed by him. The carrier (first one) should be aware of the potential relationships in terms of actions to be made by the next receiver and how to make it easier for them and then creating the best possible condition for ball progression. In this case the next action is inherently going to be a lay-off but there are several variants and types depending on the direction and timing of the third player movement (e.g. diagonality, first touch, etc. ); the first carrier should try to anticipate to the extent of possible these factors when making the pass controlling the speed, weight and direction of the pass. The value of diagonality is also shown in this game through pure positioning and player dynamics, this is due to the positioning of two depth players which will provoke diagonal passing options for the carrier. These options are especially valuable after a horizontal pass between players because while the defenders are readjusting, the possibility to play a pass against their shift is going to be very valuable. It will also make an easier lay-off to the blind-side of the defenders oriented in that moment towards the opposite side. (see figure 3). Horizontal passes in this sense manipulate orientation points and force a readjustment in the defenders positioning, to get access to the ball and thus opening vertical or diagonal passing options. As highlighted above this practice gives huge emphasis to the positioning of the players off the ball to open the depth options and to create certain arrangement that makes it impossible for the defenders to close all options. Obviously, this role is easier given the numerical relationship but even in that case, if the players are not properly arranged it would be easy for the defenders with the basic notions to block the depth options while still being able to press the ball. The players off the ball should position themselves within the basic rules of positional play in order to create diamonds and triangles between them. They should not come near the ball carrier nor blocking the depth passing options. The last rule is essential since they should move in such a way that they do not block the vertical-depth option which is the most valuable one. Moreover, their importance in the manipulation needed to open the passing line to the depth-players has to be highlighted and is, again, closely related with the efficient execution of the positional playing principles, such as passing to attract, making separation movements to open passing lines, not coming near the carrier, using a fake pass, etc. 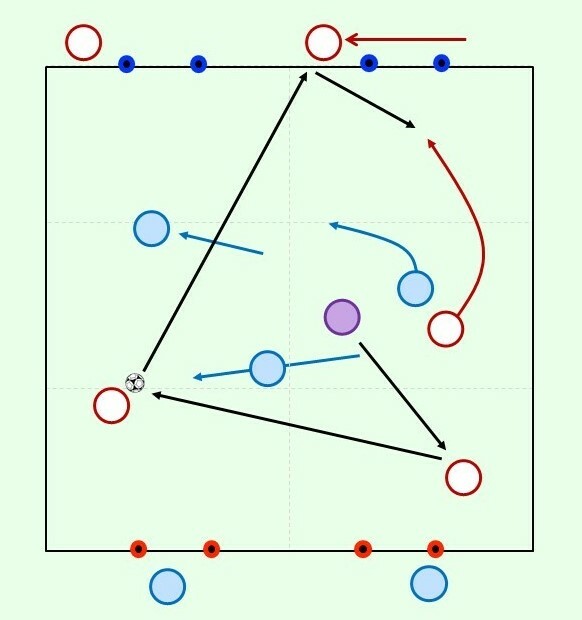 Using the numerical superiority provided by the neutral player makes it easier to progress the ball, but still they have to understand when the dynamics of the situation allow or require a second line passing option to then connect with the depth-players instead of directly passing to them. Being ready for the pass: Even if it is easier for them they should still anticipate and perceive the references of the game, trying to have enough information to make the quick action if needed. This is obviously relevant since their role is key in creating the scoring chance for a third player. Adjusting their positioning regarding the ball and the second line players. They should create vertical and diagonal options to be available for the ball carrier in any moment. This implies making adjusting movements in their own zone to open new passing lines. 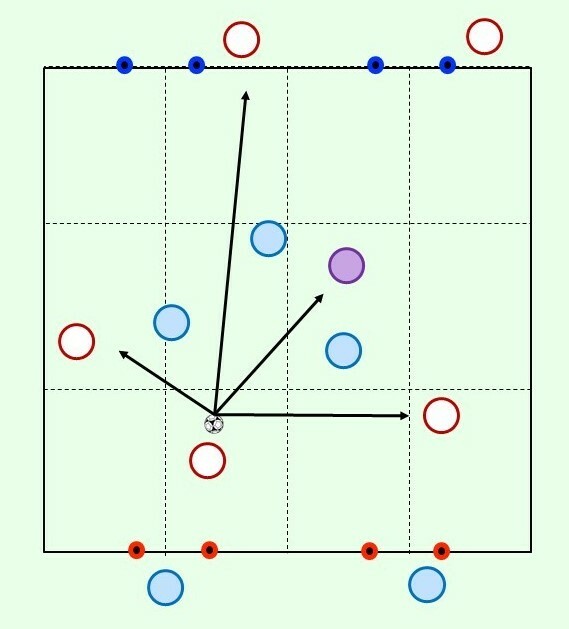 Also, even if in the first instance the responsibility of not blocking the longest passing option is from the second line players, there are some situations where due to the dynamic or because an incorrect positioning from the second line players the depth players should readjust and move to open a new passing line due to their better field of vision and time to reach new spaces. Lastly, the depth players have also to manage the timing and target in the lay-off; when to play quick and when to keep the ball, giving time to reach the optimal positions and where to play the lay-off: sometimes the layoff will be better to be directed to the same zone they are playing in (especially after a diagonal pass), but there can be situations where the lay-off should be played diagonally towards the opposite zone (usually after a vertical pass). From here we can infer a usually employed rule: Try to change the zone after a vertical pass. This is explained for the reasons that make the third man action useful. 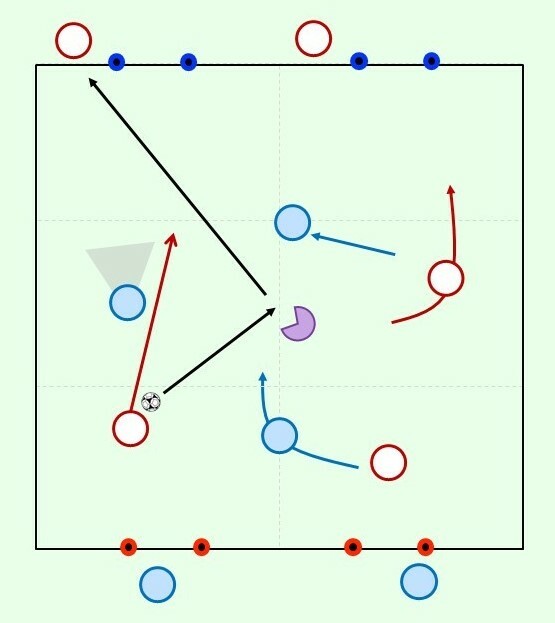 After connecting a pass in one direction/zone to then change the point quickly to another one, the opponents are going to need some time to change their orientation and attention from the first reception point to the next one to react again. This time can be exploited by the attacking players to gain advantage since they have more time to react and coordinate with the player making the lay-off. The last relevant idea to take into account in this task, is the follow-up action or whether to join after making a pass to a depth-player. It implies a need of dynamism in the actions of the players in order to provide quick support to the depth-players to score after a lay-off. The players off the ball should be aware and to certain extent, anticipate, the vertical pass being ready to score after a lay-off. For them, attacking the blind-side of the defenders after the vertical pass is a very valuable action, since the possibilities to perceive both references within their field of vision are very low for the defenders so the depth-player only has to make sure his action and the movement of the third player are coordinated and with appropriate timing to score a goal. The lay-off and scoring “pass” must be one-touch actions: More speed of play and dynamism. Scoring is valid after a direct pass inside the small goals towards the neutral: More direct play and more risk in the actions to encourage riskier short passing to create vertical passing options. Scoring in a fourth-man action is twice as valuable. I am not going to explain the usual changes in touches restrictions or in the playing space dimensions or using different number and dimension of the goals but you can read a good piece with related ideas here. I haven’t explained the usefulness in working with the transition after ball recovery but I also think this is well explained in George’s piece.